It's 1:33am and I'm still up. I'm on my second Monster Energy drink of the day. I'm dog sitting Lily because mom is in the hospital and has been for a few weeks. Dad goes to see her, I take Lily on the weekends. This weekend I'm working on computers for my job, partially because I am stressed, but mostly because it's what I can control. That's my coping mechanism when I'm up against something I can't fight. I take something I think I can control and start wreaking havoc. I'm also chatting with a friend of mine on Facebook. We talk daily. But with both our lives being a circus lately, we are catching up more frequently just to stay current. He's been having medical issues, and I've been updating him on my mom and mother-in-law, both of which are fighting medical battles of their own. He and I were going back and forth on whether or not he wanted to write an article regarding his newest hassle, and it got me thinking. There's this movie that came out recently, The Meg. It will definitely get it's own post, because I can't love this cheesy movie enough. But for now, suffice to say it's a new shark movie starring a carcharadon megladon, and in the spirit of both Deep Blue Sea and JAWS. Anyway, there's this great scene where Li Bingbing and Jason Statham are having a moment. I don't want to give anything away, but basically she judged his efficacy as a hero on an incident in the past that she heard second-hand. Based on a new incident, that she was actually present for, her whole opinion of him changes. Still with me? What's great is the quiet moment where he looks at her and says something to the effect of, "It's not easy. Being the one who survives." Arguably one of the better lines in the movie overall, but an unexpected truth. You see, I work as a hardware technician for a mental health and addictions counseling agency, and I've been very open lately about my own struggles with mental health. Talking about your own struggles tends to open other people up, with the effect that you wind up sharing battle scars and talking shop survival shop. One truth that I've found is that across the board people tend to say they're different after their struggles. They evaluate their jobs, friendships, and relationships differently. For better or worse, it's an eye opener. "It's not easy. Being the one who survives." But damn, ain't that the truth? I don't think that we give enough credit to the people who survive every day with bipolar disorder. Schizophrenia. Depression. Anxiety. OCD. ADHD. PTSD. Those are a just a few of the various diagnoses. In fact, there's a whole book just devoted to mental illnesses. But part of the problem is that the conversation only seems to come to light when we lose a celebrity. When someone high profile loses their battle. But in the meantime the stigma and the shame remains. It's not easy...keeping your illness hidden and holding down a job. It's not easy...getting out of bed and facing the day. It's not easy...trying to keep it together when everything is falling apart. It's not easy...finding the correct medication/therapy/coping mechanism/doctor/hospital/shrink/counselor. It's not easy...being the one who survives. But it's always worth it. Don't Read This Book at Night! When I found out that Kody Boye was writing a novel about an alien invasion I was giddy with excitement. He's a talented author with solid world-building and character creation skills. I also know from reading his previous works that he's not afraid to kill off a character - no matter how important the reader thinks they are! I got my paws on When They Came and couldn't wait to start reading. Kody completely bypasses the lead-up to the invasion and instead drops the reader in the aftermath. Humans are trying to rebuild their society and struggling every step of the way. Now, as if this isn't all frightening enough, Kody introduces alien foot soldiers straight out of your worst fever dream. They are like werewolves, but more vicious. (No, I didn't know that was a thing either until reading When They Came!) The reader is introduced to them one night when Ana Mia is guarding the wall, and it gets overrun. Suddenly her world is tossed into chaos and she's forced to fight harder than ever for those she loves. I really really want to go into more detail but I can't. Part of the greatest fun in reading Kody's novels is seeing what happens next. The obstacles that his characters face are never too fantastical as to be unrealistic, and they're always heartbreaking to the extreme. I read When They Came on my Kindle, in the dark, and with my trusty little Boston terrier. I absolutely couldn't stop reading. Every page brought more depth to the story, more concern for the character's plight, and more excitement. There are two more stories in the series, and I'm spacing them out a little because I know if I fly through them now, I'm going to be blowing up his social media begging for another installment. Do yourself a solid favor and grab this series NOW. And, if you're courageous enough, go read it in a dark room while wrapped up in a warm blanket. You'll thank me later! Emma and Leslie are back for more! Generally speaking, I'm not a girl who reads mysteries. Or, at least, I used to be a girl who didn't read mysteries. Kelley Kaye's Chalkboard Outlines series changed that for me. The two teachers at the center of the series are English teachers Emma and Leslie. Emma is a sweet Southern belle who drips with charm. Leslie is a plucky counterpoint who loves to quote Shakespeare. Their friendship is endearing and realistic, as are their characters. I have to confess that one of the reasons that the series is appealing to me because I used to be a (Spanish) teacher. Kelley's depiction of the school day and the teacher's workloads are extremely real. Often Emma and Leslie have to wait to see each other on lunch in order to share new insights into the murders. They also discuss having to grade papers and plan lessons. I appreciate these touches - it kills the immersion for me when fictional teachers don't seem to actually have to do their job. Watching them juggle the responsibilities of relationships, careers, friendship, and investigating is great. I love strong women characters, and Leslie and Emma are no exception. Poison by Punctuation finds the girls starting a new school year. Emma is more settled in, since this will be her second year. Leslie is on the prowl for a new beau and being her usual witty perky self while doing it. However, their fun comes to a halt when they find the body of a cheerleader just days after she received an anonymous note. Desperately hoping that the death was accidental, it quickly comes to light that the death was anything but. The clock is ticking, and Emma and Leslie have to figure out who is sending the anonymous notes, why they and others have been targeted, and what it has to do with the murder. I have to confess that at the time of writing this post, I haven't finished the book. I'm 46% through it, and am planning to go home and curl up with Zelda and do nothing but read. I received an advanced reader copy and have been reading it while trying to settle into a new job. Truth be told, I'm counting down the hours. Kelley Kaye writes the kind of book you can't wait to get home and read, and just knowing there are hours between now and when I get to sit down and read is a special kind of torture. Poison by Punctuation is every bit as delightful as it's predecessor, Death by Diploma. Kelley gently reminds the reader of the events in the first book, without seeming intrusive or like she's treading old ground for want of something new to say. I am having a blast trying to figure out who killed the cheerleader, and whether or not the notes indicate who the next victim might be. Whether or not you're into the mystery genre, I highly recommend Kelley Kaye. Pick up Death by Diploma, and then follow it up with Poison by Punctuation. You won't be disappointed! Here we are....on the last day of the year. When I was younger, that felt magical. When I hit high school, it just meant the end of the longest break from school for the year. In college I became all about the resolutions. This year is different. I know I keep going back to it, but the two years since my grandparents and uncle passed have been under more scrutiny than any other time period in my life. Maybe that's because it coincided with my 30th birthday. Maybe it's because my family dynamic changed suddenly. All I know is that this December 31st is vastly different than any other December 31st that I can remember. This year was a jumble of medical issues (broken finger, infected finger, having strep twice, more fighting with anxiety and depression), and a roller coaster at work. Opening the outpatient clinics, the big Children's Hospital move, and then winding up unemployed. What I do know for sure is that change will happen. Independent of anything I do, change in inevitable. Knowing that makes the whole idea of resolutions silly. We are never the same people at the end of the year that we were in the beginning. This coming year I want to focus on accepting change more readily. 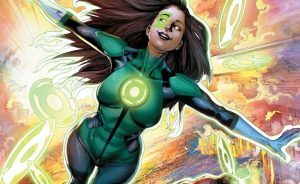 Last night I read Rage Planet, which is the first graphic novel featuring Jessica Cruz. This serves as the intro to the two new Lanterns, and is amazing beyond explanation for someone suffering from anxiety. Jessica's partner, Simon Baz, is unimpressed with Jessica because of her struggles. However, through the course of the book, they come to trust each other and to see that even though flawed, there are reasons why each was chosen to be a Lantern. 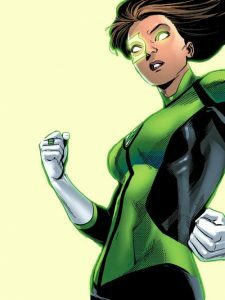 I absolutely love the character of Jessica Cruz. She's more than just a superhero. I can relate to her as a human being. I know the Green Lantern interjection feels like I've fallen off course in this post - I haven't. I promise. You see, rather than trying to change, I want to be better at handling change. I want to be able to go with the flow and not be so rocked by change. I want to believe in myself. I have Family and friends, and I know who I can count on to help. But I think it's time I learn to believe in myself. Change will come, whether we want it to or not. The only thing we have control over is how we handle it. This coming year, I am focusing on handling it with grace, optimism, and no small amount of self-forgiveness. I know this won't be easy or immediate, but it feels like a goal worth working towards. Have a safe and happy New Year, and don't be too hard on yourself. You've got this! December 12th marked the beginning of Krampusnacht - the holiday event for Secret World Legends. Given my work schedule this week, and being without a car until we could take it in for service, I haven't really gotten into the game until today. I thought I was burned out from the Halloween event, but seeing all of the snow, Christmas trees, and costumed characters has certainly put me back in the mood! Every hour you can kill a boss called Hel, which is a huge naked lady who packs a helluva punch! You can find her in Agartha, where the seasonal raids are. Every day that you log in during the event you are given a Malevolent Snowflake, which you open after killing Hel. You also get a message from your faction handler and a package for every kill. The message and package don't have a cooldown. You get them each time you kill Hel. If you're behind in snowflakes, like I was, you can open those until you run out. You just have to kill Hel each time you want to open one. The buff lasts for a little bit, giving you time to exit the instance before you have to open your snowflake. The seasonal rewards are pretty fun! I'm currently rocking an ugly reindeer sweater, and previously I was wearing a teal Elfin shirt. Looking around, there's so much to get! There are Victorian era caroling costumes, different elf outfits, and general winter-themed clothing. On my last round, I got the Revenant Bear pet. I haven't looked into how many pets are new for this event, but my brother told me there's about three. My niece is big on them. The first day of the event, upon logging in, the main reward was a Christmas-themed tree pet. Part of the Padurii creatures in the game, they resemble a mixture between a bulb and a tree stump. I'm not sure if it's the tree hugger in me or the rampant eccentric, but I freaking love these little tree-guys! The title card for the game has also been changed to reflect the new event. Instead of the red we're used to seeing on logging in, we now see cool blue. The girl in the picture is also holding a present, and surrounded by ugly Krampus figures with glowing eyes. 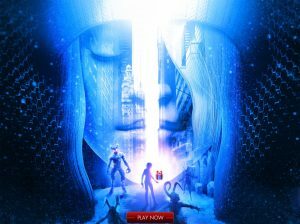 It's creepy, stylish, and everything you could want from Secret World Legends' holiday event. Another change that Krampusnacht has brought is the introduction of the Winter Cache. Drops include weapons (with wintery skins), a winter clothing set, and more. For the moment I'm just enjoying collecting the caches, I'm still working on the Haunted Cache. I don't have the tarantula bike, the weapons skins, or the black widow pet. Once I do, I'll most likely sell the rest of my caches to a vendor. Continuing my run of poor in-game fashion (according to Phoebe), I have decked myself out in the blue knitted reindeer sweater, knitted heart gloves, boots, and bell bottoms. Since the most recent patch also introduced the much-awaited Barbershop, my hair is also now purple. Dipper contends that I look like a teacher, Phoebe thinks my bell bottoms are embarrassing. I, however, am in my glory! I am on a mission to collect as many of the knitted sweaters as I can. Right now I have a black knitted sweater and my Illuminati faction knitted ugly sweater. I also have the teal Elfin tunic. The purple accents of which match my hair flawlessly! Look for future posts on this most festive of events, and if you haven't already, get thee to the Secret World! You don't have to get a paid Patron account right away (though the cache key, and shardless teleporting to cities makes it extremely worth it! ), you can just play for free. Either from Steam or from the website directly. It's not going to become a second job like some online games (Warcraft - I'm scowling at you!) and the player base is largely friendly and helpful. If you do decide to give it a whirl, you can find me as "deadaeris". Drop in and say hello! I promise you, Charnel House Reviews is nowhere near dead! Despite an absence of several months, I have returned to bring you honest reviews on everything HORROR. For those of you wondering where I've been - it's all been work related. The clinic moves were smooth and quick, compared to the hospital! The deadline for the hospital was November 10, 2017. Up until that date I worked 6 days a week, often more than 10 hours a day. As crazy as it sounds, other support departments like Environmental Services, Plant Operations, and Clinical Engineering worked as much (if not more) than my team! Electrical wires don't install themselves, in the same way that patient rooms aren't sterilized until a team goes through and cleans them. All in all it was grueling, exhausting, and sometimes unnoticed work. (People don't always realize how much support services do - I know I certainly knew only a drop in the bucket of what the other services did until working with them.) Along the way I met some really amazing people, and we pulled it off in ways we hadn't even expected, given the obstacles we encountered along the way. In many ways I'm still recuperating from the exhaustion. But knowing we did it for the kids makes all the difference! The hospital is up and running, we've passed our critical support period, and things are settling in nicely. I'm getting back to my hobbies and trying to get ready for Christmas. The 29th is going to be my last day with the company, unless I am hired on permanently. I am one of 6 applicants, and bossman says he'll let us know next week. Fingers crossed! All my life I've been interested in the idea of death and its associated imagery. 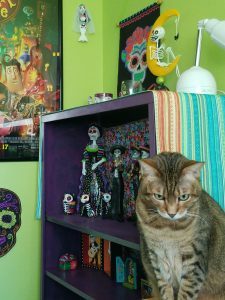 I was absolutely in my glory when I came across Día de los Muertos, a Mexican holiday that celebrates the lives of lost loved ones. Full of skull imagery and bright colors, it felt tailor-made for me. Not to mention, the focus is on remembrance and it does a great deal to take the fear out of death and the uncertainty of the afterlife. My brother first introduced me to Caitlin Doughty's Smoke Gets in Your Eyes, and I found it an amusing and enlightening way of looking at the death industry. (Take a look at my review here.) When I found out that she had another book coming out, I was absolutely going bonkers until it was released! 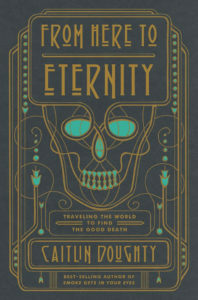 From Here to Eternity: Traveling the World to Find the Good Death is, as well as being a gorgeous volume with captivating illustrations, a splash of cold water in the face of American death perception. Until reading this book, I had never really thought about what other countries and cultures did with their dead. Literally! Each segment of From Here to Eternity focuses on a different region, and details her observation of and participation in the death rituals. Insight into the sometimes-baffling rituals comes from Caitlin speaking directly with the people involved. They are surprisingly open about the origins of their rituals and the way they feel about their dead. Caitlin is respectful at every turn, and in her the practitioners seem to find a kindred spirit. Locales vary from India and Japan to Mexico and Bolivia. The rituals themselves are also varied. Some involve returning the body and the spirit to nature, while other involve keeping the memory of the deceased front and center by visiting the body yearly. My favorite practice are the ñatitas. In Bolivia, people have dreams where skulls call to them. They retrieve the skulls which are placed in honor in the house, and become an intermediary between the living and the dead. People come and visit the ñatitas to ask favors that they may not feel comfortable asking of the saints. They can ask for protection, financial aid, or help within the home. As Caitlin points out, this is also an important function to this practice. Oftentimes, women are the ones housing, caring for, and petitioning the ñatitas. These women often feel removed from the predominantly Catholic region. The ñatitas give them a measure of control over their faith and a recourse for help when the Church may not intervene. More than anything, reading Caitlin's books has made me really start thinking about how Americans, myself included, react to death. I have seen firsthand the aversion to grief, the way that people don't know how to comfort someone grieving. The way there seems to be an unspoken moratorium on how long someone is allowed to grieve, or how closely related to the person they have to be for grief to be acceptable. Reading about the practices of these cultures has also confirmed Caitlin's point that our culture doesn't really have many safe spaces to work through grief. When my grandparents and uncle died, I cried almost nonstop at the funeral home during the wake and the funeral. It was horrible. Antiseptic. Generic. Heartless and soulless. After my uncle's wake we congregated in my grandparent's home, which was in the same city and empty because they had passed a little earlier. The house was riotous with laughter and stories, and the smell of Lebanese food. We passed around pictures and shared memories, sitting on furniture we recognized. In our own space. Our own bubble of shared grief. It's true there were tears, but there was no condescension, no platitudes. I feel robbed knowing that there was an option to have their bodies upstairs in their own beds. Where we could care for them and say our goodbyes on our own. And hold our wake beyond the hours designated by the funeral home. My uncle's wake went over the allotted two hours. It wound up being closer to three, and it was evident that the funeral staff was more than ready for us to leave. I was ready too, because the photographs and mementos of our family history felt out of place in that awful peach-colored room with the borderline 80s furniture. I agree with Caitlin. It's time to take a closer look at how we deal with death, and time to have an honest conversation. I can't recommend Smoke Gets in Your Eyes or From Here to Eternity highly enough. Whether death scares you or not, and regardless of your religion or lack thereof, these books are thought-provoking. Even if the reader doesn't necessarily change their view of death and the death industry, they're certainly conversation starters.